Report by Kahnu Nanda; Jagatsinghpur: The Mahanadi Suraksha Yatra which had started from Sukhsaoda village of Jharasuguda district was concluded at Paradip after covering 15 districts on Friday. Speaking at the conclusion event held in Biju Maidan on the outskirts of Paradip port town chief minister Naveen Patnaik described opposing BJP rule union government and Chhatisgarh Imperative saffron government over river Mahanadi concern, Odisha ruling BJD had started a political drive against BJP the 10 day long stir has become a people’s movement in state, entire Odia people are united to save Mahanadi drive, under no circumstances we will let the lifeline Mahanadi to go dry, CM urged. The Odisha’s saffron supporters and union ministers are shedding crocodile tears over Mahanadi issue indirectly helping Chhattisgarh BJP government so CM appealed to all and BJP counterparts to come forward and join in the movement for safeguarding the interest of odia people. Basing on our pleas honorable Supreme Court of India had directed union government establishing Mahanadi water tribunal finally it got central government nod but the term of reference yet to come out, meanwhile Chhattisgarh government has not deferred its project constructions a halt the situation has worrying crore of Odia people across state. Patnaik lamented that when our farmer is at stake due to highhandedness of Chattisgarh government with blessings of union government our BJP leaders are considering the situation under political reasons ignoring interest of Odia people, he appealed saffron supporters of state to put pressure on both union and Chhattisgarh governments to stop any construction activity over Mahanadi, CM Patnaik suggested. Paradip MLA Damodar Rout presiding the conclusion meeting said the union government under leadership of Prime Minister Narendra Modi is not concern with Mahanadi issue demand of Odia people, when his predecessor Atal Bihari Bajpai was prime minister had rightly interfered when four south Indian states were fighting for the Cauvery water issue, Rout described the prime minister Modi’s act shows violation of constitutional norms, he alleged. 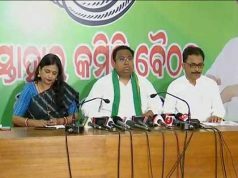 Other BJD leaders, MPs, MLAs and ministers as Praffula Samal, Pratap Jena, Niranjan Pujari, Snehangini Chhurey also spoke on the party lines and asked union government to act as per law of the land. On the flip side district BJD President Bishnu Das’s absence in the event was fluttered among the people sources informed that supports Bishnu from Jagatsinghpur constituency were partially Skipped the meeting even his strong Paradip hold trade unionist Santosh Patnaik was absent at the meeting. 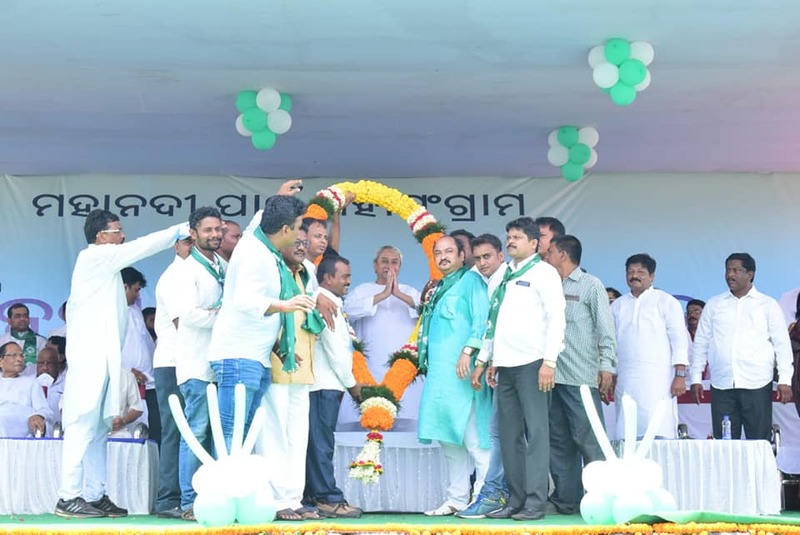 Replying the queries over Bishnu’s nonattendance at the meeting minister Praffulla Samal informed due to illness Bishnu avoided the meeting, the former has successfully conducted BJD’s Mahanadi Surksha Yatra in Jagatsinghpur, Biridi, Naugaon areas, Samal said.